Since 1972, Roland has worked to create the ultimate piano experience, and The new HP pianos are among the most exciting yet. 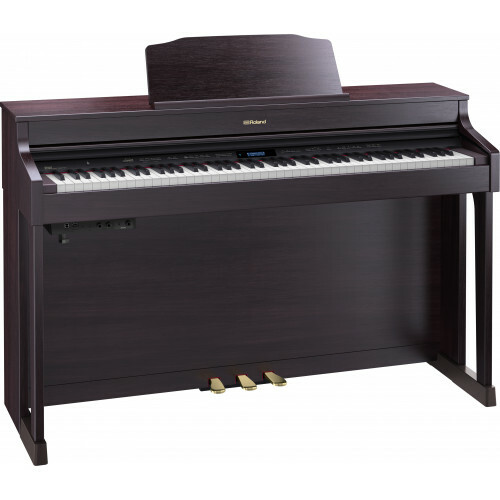 The HP piano philosophy is all about bringing the sound and performance of a concert-class piano into your home, with a choice of cabinet styles, colors, and speaker systems to suit your lifestyle. The premium HP-605 is powered by the latest version of the , along with a unique keyboard that blends wood and molded materials for great feel and durability. The HP-605 connects via Bluetooth® technology to your smartphone or tablet so you can hear your music-making apps or online piano lessons through the powerful six-speaker sound system - your kids will love it too as it makes learning piano fun. And even though it’s compact, the classically-styled HP605 will definitely make a big impact in your home especially with a choice of finishes including polished ebony, contemporary rosewood, and contemporary black or white. Roland’s Acoustic Projection speaker system reproduces the rich sound of an acoustic grand piano. The HP-605 houses a three-way, six-speaker system, driven by a powerful four-channel amplifier and each section fulfils a specific role in delivering superior piano tone. 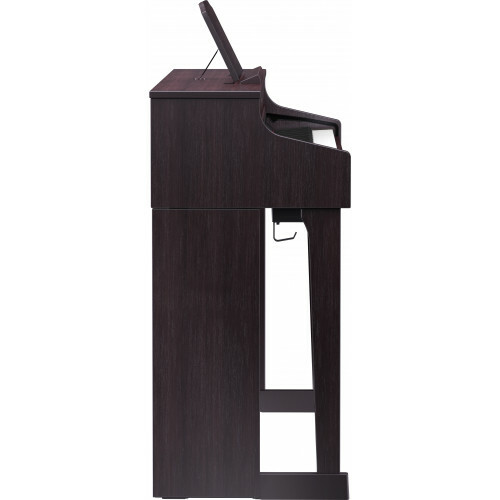 The powerful cabinet speakers produce the all-enveloping main piano sound, while the top-mounted spatial speakers reproduce the resonance of the piano’s frame. Finally, the nearfield speakers project the sounds most likely to be noticed by the player, including dramatic, dynamic overtones and even the noise of the hammers as they hit the piano string. The increased height of the cabinet further enhances the richness of the sound. The wooden piano keyboards often found on acoustic pianos are attractive to look at and they feel solid and substantial under your fingers. But a completely wooden keyboard is not the best approach for a digital piano, as wooden keys need regular maintenance to keep them in the best condition. 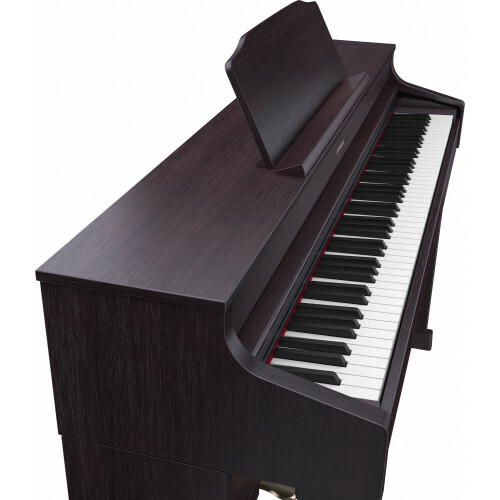 The HP-605 has a new type of keyboard that blends wood and molded material for the best of both worlds; beautiful wooden sides give each key a familiar, rigid mass that feels just right to play, while the durable inner frame means you can enjoy your Roland piano every day for years to come without worrying about reliability. You can play it every night too - as our piano key construction also produces less of a “thump” noise when played. It’s not just the feel of the keys either; the way they move is also important. Each key has a stabilizing pin to ensure the vertical travel of the key is smooth and precise, avoiding the sideways key movement and noise experienced when playing glissandos on some pianos. Since the HP-605 has the latest piano engine onboard, Roland also retuned the key sensing system to match it, ensuring that the sound and keyboard work in complete harmony for the ultimate piano experience. Finally, the keys share the look and feel of real ebony and ivory, and their moisture-absorbing properties mean your fingers won’t slide off when playing. Today, people often play and learn the piano with the aid of smartphones and tablets. Using Bluetooth technology, the HP605 wirelessly connects to your mobile device, enabling you to take advantage of popular iOS/Android apps and online practice videos. Once connected, the audio is routed through the piano’s internal speakers, or headphones if you prefer to practice in private. 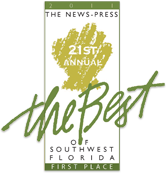 Then you can play along with your favorite artist and bands or practice with some of the very best piano teachers. You could visit Sheet Music Direct to download a wide range of music scores, or install iOS apps like PiaScore with free access to over 70,000 classical music scores; you can even turn the pages of the score on your iPad/iPhone screen by pressing the piano’s pedal. Although it’s packed with advanced technology, the HP-605 is reassuringly traditional when it comes to style. Combining classic lines with a space-saving cabinet full of presence, there are four premium finishes available; polished ebony, contemporary rosewood and easy-to-clean contemporary black and white. 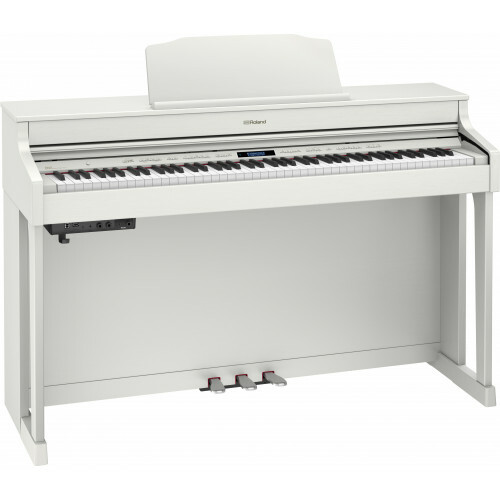 Once your piano is home, you don’t even need to press the power button to get started - just open the lid and start playing. The Compact Home Piano with Concert-Class Sound The HP-603-A is powered b..